The Nokia(s nok) Lumia 900 is now AT&T’s(s t) “hero” phone, the carrier tells me; a highly regarded status essentially owned by Apple’s iPhone(s aapl) since 2007. Part of the reason is surely AT&T’s fast new LTE network since the Lumia 900 supports LTE and the iPhone doesn’t. But could there be another reason given that last February Nokia (s nok) abandoned its own mobile platform in favor of Microsoft’s (s msft)? Might this be a true Windows Phone flagship device in the U.S.? I’ve spent the last week testing a Lumia 900 on AT&T’s network in a few cities and the short answer is yes; this is a phone that is a true alternative for people looking for something other than an iPhone or Android (s goog) handset. First things first: AT&T is aggressively pricing the Lumia 900 at $99 on contract, $449.99 without. Both prices are a bargain in my opinion as I’m used to paying $600 or more for a high-end, unsubsidized handset. I suspect that Microsoft and Nokia worked with AT&T to keep the costs down as all three companies have something at stake. Microsoft is looking to boost market share for its platform; Nokia has to turn around slumping sales; and AT&T is trying to steal attention away from potential Verizon(s vz) customers with its competing LTE network. So what do you get for your $99, assuming you buy on contract? Well built, smartly designed hardware. I’ve often said that Nokia’s problem was never hardware; the company always built great devices. And the Lumia 900 is no exception. The 4.3-inch display is crisp, bright and clear; even outdoors. The polycarbonate body — available first in cyan and black, later in glossy white — is light but solid and any scratches will be somewhat hidden since the color is the same throughout the inside of the body. Although the Lumia 900 falls into the large screen camp, the device is surprisingly small; about half-inch taller and wider than Apple’s iPhone 4S with a 3.5-inch screen, for example, and nearly as thin at 0.45-inches. With curved edges, I find the Lumia 900 easy to pocket and hold. Inside is a single-core Qualcomm(s qcom) 1.4 GHz processor. Now that we’re seeing faster dual- and quad-core chips, some might think the Lumia 900 is underpowered. They couldn’t be more wrong because Windows Phone is well optimized to run on less-powerful chips, similar to the iPhone, which uses an 800 MHz single core processor. Overall, the phone is snappy in apps and navigation, making it feel like there’s a turbocharger under the hood. Other key components include 16 GB of storage, of which 14.5 GB is available. There’s no memory card slot, but you do get 25 GB of cloud storage on Microsoft’s SkyDrive service. The Lumia has Bluetooth 2.1, Wi-Fi (including a hotspot feature), a gyroscope, 3-axis accelerometer, microSIM slot, 2 microphones and two cameras. These include a 1 megapixel front-camera with f/2.4 aperture and a 28 millimeter 8 megapixel rear camera with f/2.2 aperture, Carl Zeiss optics, dual LED flash and a dedicated shutter button. Images are quite sharp although I think the iPhone 4S does a slightly better job with overall balance. And the Lumia seems slow to adjust for bright and dark areas; particularly when recording 720p video. These days, a smartphone is only as good as the network is on, unless you’re always nearby a Wi-Fi hotspot. I tested the Lumia 900 in New York City, which is the closest area that AT&T covers with LTE. And the results were impressive. Most of the time, I was experiencing downloads in excess of 20 Mbps while averaging uploads around 5 Mbps and typical latency of 80 milliseconds. That means if you have a Lumia 900 in one of AT&T’s 31 LTE areas, you can download movies in minutes, not hours, for example. But most people aren’t in an AT&T LTE area, so I did more detailed testing outside of the LTE zones. It turns out that the phone’s connection is still plenty fast; sometimes more than twice as fast as my iPhone 4S in the same locations, even. Why? Because the Lumia 900 falls back to a 21 Mbps HSPA+ radio, giving me downloads up to 9 Mbps in speed in places where my iPhone tops out at almost 6 Mbps. Perhaps the smartest design decision for this phone is the fast HSPA+ radio because the fallback speeds are still spritely. How does the Lumia 900 work as an everyday phone? This is the ultimate question since most current and would-be smartphone owners are hearing iPhone and Android as the only choices. After using the Lumia 900 as my daily driver, there’s clearly a third choice on a major U.S. carrier now. I won’t fully review the Windows Phone 7 platform as I’ve already shared thoughts when the latest update arrived. But anything I typically do on my iPhone or Galaxy Nexus is a breeze on the Lumia 900; in fact some activities and features are faster or easier to use. I’m finding the constantly updated Live Tiles, for example, to better in some cases than some of my Android widgets. Multitasking is much improved in this version of Windows Phone: Just hold the back button to see the currently running apps and tap one to switch. Want to share photos to any number of services such as Facebook, Twitter, in IM or email? No problem. You can view your Facebook photo albums right in the Pictures hub as well. Multiple inboxes? Piece of cake as Windows Phone has a fantastic email client that includes a unified Inbox if you want to link multiple accounts. Browsing on this version of IE is enjoyable as well. Battery life is quite good; this should be an “all day” phone for all but the heaviest of smartphone users. Apps and games? This might be the most talked about “achilles heel” of Windows Phone and if you have to be on the cutting edge of apps, this might give you reason to pass. But of the 70,000 apps in the Marketplace, there’s a fair number of top-tier titles. Think Kindle(s amzn), Netflix(s nflx), Angry Birds, Spotify, Foursquare, Evernote, and IMDb to name few. Often, these apps actually look better on Windows Phone in my opinion, due to the Metro user interface layout. That Microsoft integration extends into other areas with the Lumia 900 as well. There’s the Zune store where I found music, videos, podcasts and support for the integrated FM antenna. Microsoft’s SkyDrive cloud storage can be used by developers for apps. And of course, Microsoft Office is pre-installed (with SharePoint support), which allowed me to use One Note, Word and Excel when I needed them. PowerPoint is part of the package too, but I didn’t have use for it. While the Lumia 900 is powered by Microsoft, Nokia has added a few nice software bits although they’re not pre-installed. For example, AT&T Navigator is front and center on the Lumia, but Nokia Drive and Nokia Maps are free downloads. Both of these are excellent apps; in fact, even as a long-time Android user, I prefer Nokia’s navigation over Google’s. Nokia also inked a deal with ESPN earlier this year and the sports app is outstanding for scores and news. I’ve already mentioned Nokia’s hardware design, but the Lumia 900 benefits from the company’s rich history of making handsets. That means it has the experience to ensure the radios work as good as they should. Although I don’t make many voice calls these days, the Lumia 900 worked well as a phone with callers saying I was perfectly clear, even on speakerphone. Is Nokia “back” and can Microsoft regain prominence in mobile? There’s no perfect phone for everyone and there’s still room for improvement in Windows Phone. 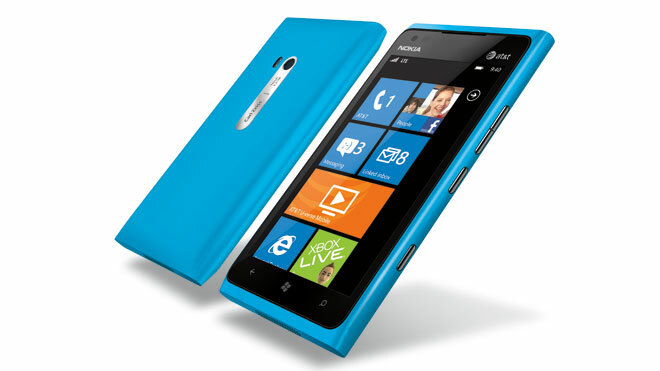 Having said that, I anticipate that with heavy marketing and the relatively low up-front cost of the Lumia 900, AT&T will sell a fair number of these phones. That’s good for Nokia, Microsoft and AT&T, all for different reasons. With the Lumia 900, Nokia has proven — at least to me — that it can bring its design chops and hardware experience to compete against the iPhone and Android devices. The phone also illustrates that Windows Phone is a very competent operating system with a fast-growing ecosystem. Where it lacks in terms of application breadth, it makes up for with desirable Microsoft services. And AT&T gains a win for launching this hardware and software combo on its new LTE network. Plus it does so with fast HSPA+ fallback where LTE service is lacking. Should you get the Lumia 900? That depends on your own personal needs of course. And if you just don’t care for Microsoft’s fresh take on mobile user interfaces, this clearly isn’t the phone for you. But if you’re even remotely interested in what a solid Windows Phone can do, you should at least look at the Lumia 900 to experience the unique Metro user interface for yourself. Right now, I can’t think of a better Windows Phone to try out or buy. I’m so impressed with what Nokia has put together that I’m considering adding a Lumia 900 to my own collection at the full $449.99 price. i love games. but playing games on a phone? hmmm i dont think so. i prefer a pc for playing games. i own a lumia 900. it was great. great for web browsing. even thou i live here in the philippines. where theres no LTE here. but still, it was fast. longer battery life, nice to hold. the only thing i dont like abbout lumia 900 is the 16gb. its a shame. and i got it blue. i really want the black. I certainly would consider this Nokia Windows phone except for the low 16GB non-expandable storage. We’re out of contract on our two 3GS 32GB iPhones. As my back-up 3rd phone, I have a Samsung GSII with a 32GB SD-card in it. All 3 phones are already using far more than 16GB of storage. We don’t ‘Cloud’ anything anymore because it uses too much of our now-expensive Data plans. So, with no AT&T or Verizon unlimited plan available, I feel that it’s a Nokia ‘mistake’ to offer new phones without a way to add additional storage. Everyone keeps saying Nokia Drive is a free download, why can’t I find it in the marketplace? Seems a little kitschy, kind of like the Kin. I suspect its lifespan will also be similar to that of the long gone Kin as well. “in fact some activities and features are faster or easier to use. ” SOME? A little more than some! This is why Windows phone has a record of ~20000 wins to ~200 losses in the smoked by windows phone challenge. pixalated? What I see is a gorgeous display just like Super AMOLED on Samsung Focus (or even better because of better readability in sunlight). In my opinion, the display on either Samsung or Nokia Windows Phone devices is much sharper than iPhone4’s retina display. In the beginning, the best mouse trap made the beaten path. Then the beaten path was deemed to make the best mouse trap. Soon, perceived goodness replaced actual goodness, and actual goodness itself no longer seems to matter. So don’t bother us with the facts. Can’t you see we are content already in our present fantasy. I tested the phone at SXSW. I have been a loyal iPhone loyalist for years and this phone is awesome. Definitely check it out. You will be amazed. Great and accurate review Om. If this quote wasn’t meant to damn with faint praise, Om needs to go back to writing class. I wouldn’t expect any other conclusion from Microsoft GigaOm. Yup this unwinable argument. We are pro Apple/Google/Microsoft. Sigh. Zato, I’m not quite sure how you’ve come to that conclusion. I’m all for constructive criticism, but I call ’em as I see ’em regardless of the company involved, be it Microsoft, Nokia, Google, Apple or [insert name here]. Thx! Hi, thanks for the great article. However, the current iPhone (4S) uses a dual core 800MHz A5 SoC… :-). I use phones from all 3 manufacturers. The Lumia 800 is now my phone of choice. Saying that the apple processor is faster, therefore phone is better is not correct. Just like saying a Nascar is faster than a Formula 1 car because it has a bigger engine. As with so many things, it’s not about what you have, it’s what you do with it. Guy, all Jacky said was the current iPhone 4S has a dual-core 800MHz processor. The analyst stated above that it uses a single core.